Mind Methods was tasked with developing an engaging exhibition presence at the 2018 Gartner ITxpo in the Gold Coast. The canvas was a large booth and branded cafe for the duration of the 3-day tech conference. Red Hat hosted daily speaker sessions at various locations and offered private consultations during the event. Despite the tight turnaround, considerable freedom was given in how to present Red Hat’s offering during the conference. Mind Methods leveraged the focal traffic the branded cafe offered. Appropriating cafe aesthetics, we created Red Hat-themed menus promoting featured speakers as “Today’s Specials”. We carried this through sandwich boards and other bespoke cafe elements. A loyalty card was issued to conference attendees as a way to playfully list Red Hat’s presence during the 3-day event as well as stimulate participation. Red Hat‘s official pictogram suite was used for the branding of these cafe items. 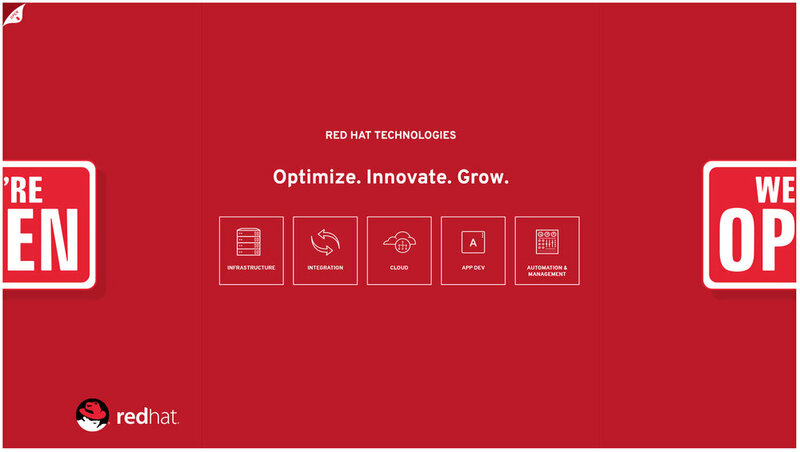 To celebrate the Red Hat’s 25th birthday, a greeting card was produced to allow attendees to send their well wishes whilst also providing customer feedback via a short survey. The card’s aesthetics and messaging was drawn from the current global campaign of “openness” and “collaboration”. We incentivised engagement by offering prizes for filling out these cards. Even though there was limited lead time, we remained ambitious with our scope. In constant communication with the client, ideas were freely shared and new wrinkles were added as we hit our marks. It was challenging negotiating the various deadline dates but the studio was resourceful and methodical in it’s approach to printers and other 3rd party support needed to deliver this interstate project. Red Hat® loyalty card, outside spread. Red Hat® loyalty card, inside spread. Red Hat® Birthday card, inside design. Gate-fold brochures inserted into the Gartner Folder, outside spread. Gate-fold brochures inserted into the Gartner Folder, inside spread. The client was happy with our open and understanding lines of communication. Whilst deadlines often became fluid and new tasks kept arising, we realised the importance of project management early on to keep track of all the moving parts. Mind Methods have partnered with Red Hat for the Gartner Symposium the past few years, with the scope increasing with each passing year. The trust that’s been fostered through our ongoing relationship with Red Hat has allowed us to make work that pushes the envelope for marquee events like the Gartner Symposium/ITxpo.